These watches were distinguished by their exceptional performance, their quality, and their pure Breitling style. In the more than 60 years since, the family has remained a favorite, and a new Superocean Collection has been created to stand up to the rigors of the most challenging water sports. With its new Superocean Collection, Breitling has updated and upgraded one of its best-loved and most successful watch families. 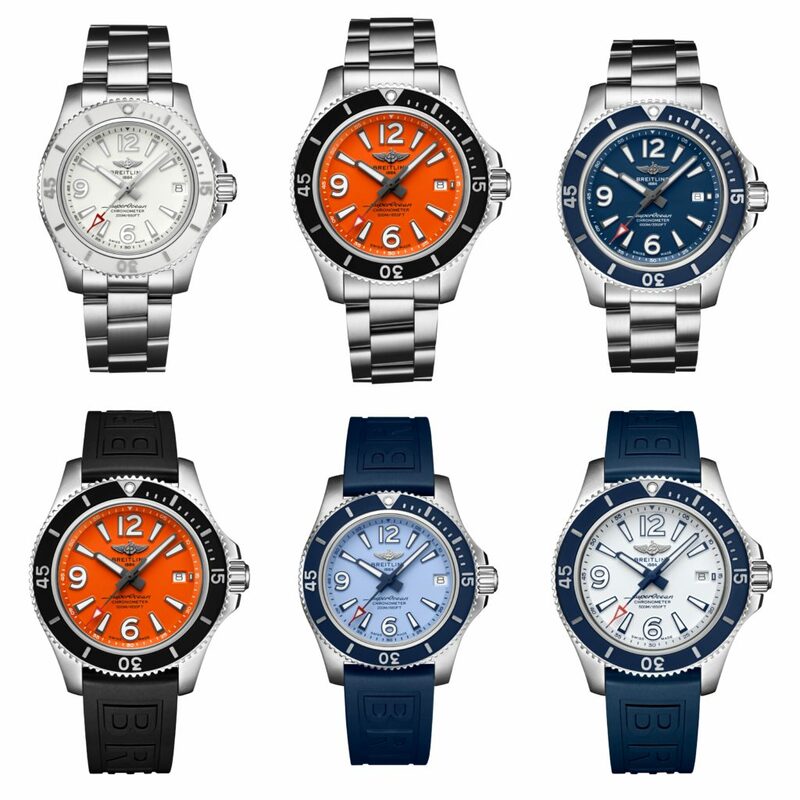 Breitling Superocean watches have been highly regarded for their diving prowess for more than 60 years. While the members of the new collection reflect the brand’s deep-water DNA, they are certain to appeal to men and women with active lifestyles. 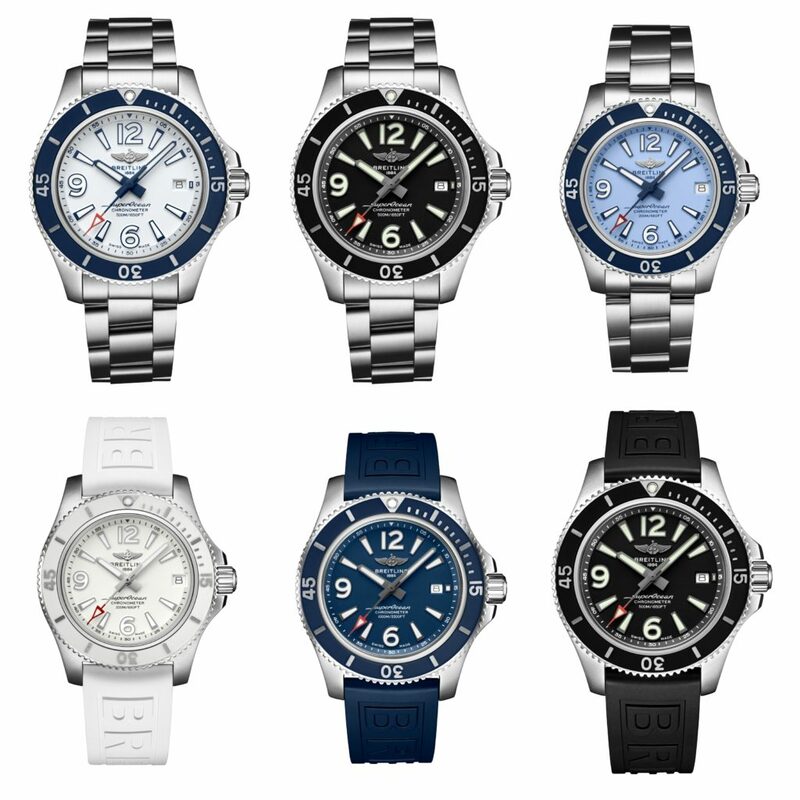 With their clean, sporty design and impeccable performance, these new Superoceans will feel at home on any wrist and in any environment. The Superocean 48 is undeniably the conversation piece of the new collection. With its impressively oversized 48-millimeter DLC-coated titanium case and blue ceramic bezel, it instantly attracts attention. Yet a closer examination reveals that there is more to this watch than meets the eye: its soft-iron inner case offers protection against the effects of magnetic fields, while the rotating bezel can be safely secured with a lock on the left side of the case. This timepiece comes on an all-new blue vented rubber strap. These vented straps are a boon for serious divers, since they counteract the effects that water pressure can have on straps at greater depths and ensure that the watch strap remains at the optimum tightness. The watch is also water-resistant to 30 bar (300 meters). The Superocean 46 has, as its name suggests, a 46-millimeter case in black steel (DLC-coated stainless steel). This big, bold watch is available with either a black or blue dial and a matching Diver Pro III rubber strap with a pin buckle or folding clasp. It has a ratcheted unidirectional bezel, an essential tool for the committed diver. The robust Superocean 46 is a true deep diver, water-resistant up to 200 bar (2000 meters). 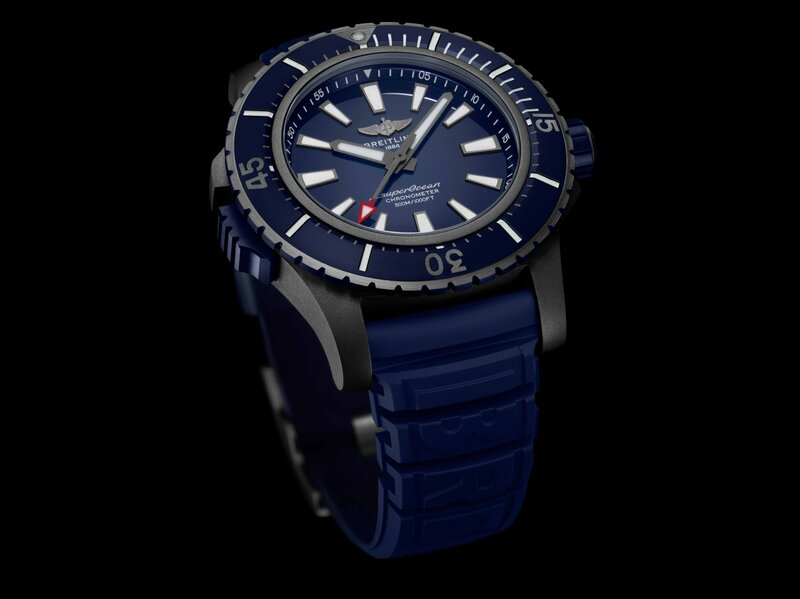 The Superocean 44, with its 44-millimeter stainless-steel case, is available with either a black or blue dial and a choice of a matching Diver Pro II rubber strap or a stainless-steel bracelet. It has a ratcheted unidirectional bezel. The Superocean 44 is capable of joining you on all of your underwater adventures up to a depth of 100 bar (1000 meters). The Superocean 42 has been crafted with a 42-millimeter stainless-steel case and a choice of a black, white, or orange dial. The watch is presented on a Diver Pro II rubber strap or on a stainless-steel bracelet and has a ratcheted unidirectional bezel. The Superocean 42 is water-resistant up to 50 bar (500 meters). The Superocean 36 is designed for women who want the quality and performance of a great sport watch in a more compact size. It has a 36-millimeter stainless-steel case with a ratcheted unidirectional bezel and a choice of either a light blue or white dial and a matching Diver Pro II rubber strap or a stylish stainless-steel bracelet. The Superocean 36 is water-resistant up to 20 bar (200 meters).